In 2016, I was feeling overwhelmed 99% of the time. Like â€¦ for real. Blegh! And not only is feeling overwhelmed NOT fun at all, but it also kills your productivity, inspiration and creativity â€¦ which â€¦ isnâ€™t good. So in 2017 I decided that I was NEVER gonna have another year where I was living in overwhelm. And over the past year and a half Iâ€™ve implemented a variety of tactics and tools that have reeeeeally helped me to kick overwhelm to the curb for good. Hard. Leaving a review helps my podcast get seen by more people so that it can make a bigger impact, plus I genuinely LOVE hearing from you. 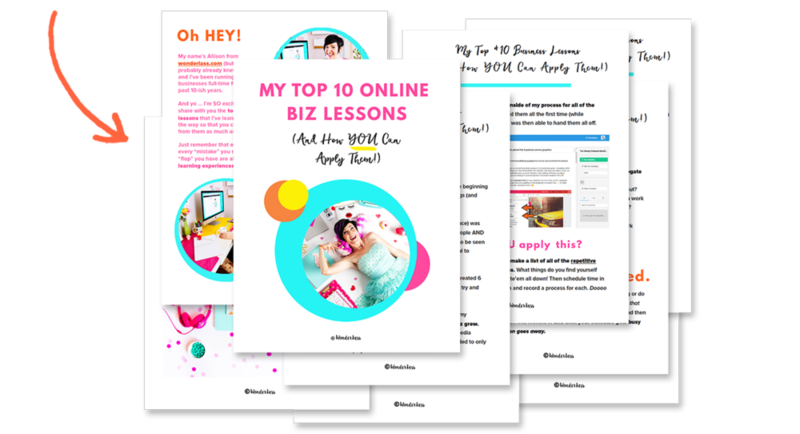 So to show my appreciation, Iâ€™ll send you a 24-page PDF detailing my most valuable business lessons along with specific action steps that you can take STAT to apply them yourself! Hope you have a wondrous weekend, you creative unicorn! And now â€¦ time to go hunt down my cat Mr. Purrie for some pettâ€™ins!